The original story is something of an urban legend which has turned into a ‘truth or dare’ type game that’s been played at sleepovers and the like on countless occasions. Bloody Mary’s famous ghost can apparently be summoned to appear using any mirror. In terms of the origins of the tale, there are many stories. However, the most widely believed – depicts her as Mary Tudor the notorious daughter of the even more notorious English King, Henry VIII. There are a variety of reasons for this – Mary was Henry VIII’s first daughter and so experienced a vast amount of death during her childhood. Also, history tells us that she developed something of a penchant for blood and violence herself. This, in addition to her supposed infatuation with herself, love of mirrors and her ‘ghost child’ leave her as a prime candidate for the origins of the Bloody Mary legend … Plus, through her relentless quest to return England to Roman Catholicism and the subsequent unremitting burning of Protestants she had garnered the nickname ‘Bloody Mary’ for herself during her lifetime as well. Together with the principal myth of Bloody Mary, comes the myth of her ghost baby, which is said to originate from her failure to have children. She was supposedly pregnant twice; both times looking as if she was with child for 9months. Despite this, she never had a baby. Which gave birth to two rumours; that she had lied, or that her baby was a ghost. These rumours are where the part of the legend dictating that if you say ‘I took your baby’ 3 times into the mirror sprang from. It is also said that the mirror represents the Queen’s documented narcissism – through this her soul became trapped in the mirror and she’s always looking for a way to get out. There are a variety of ways that you’re meant to be able to bring Bloody Mary out of the mirror. These range from walking up the stairs in the dark, backwards whilst holding a candle and a hand mirror to saying her name three times whilst staring into a mirror in a dark room. Whichever method is used, she is said to appear with a thirst for vengeance upon whomsoever was unfortunate (or silly) enough to summon her. She can appear as a corpse, a ghost, a witch or a woman covered in blood. She can then go on to exact revenge in myriad ways, strangulation, blood drinking and eye gouging are purported to be the most common. Or she can follow you until you die a horrible death. It is told, that she will only retreat into the mirror once the person who summoned her is dead. Personally I don’t believe it, but next time you’re looking into your stunning MirrorWorld mirror, my advice is not to tempt fate – just in case. 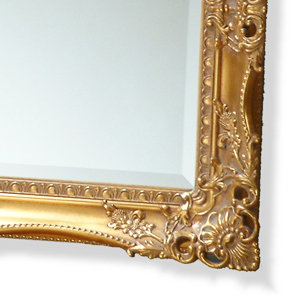 The LC132 from our selection of beautiful Decorative Mirrors has a gorgeous Rococo look. You can easily imagine yourself adding your beauty spot before heading off to a ball under the reign of Louis XIII in France with this artistically framed oval mirror. With its rectangular ivory frame, delicate carvings and serious elegance, not only does it add grace, it adds a bit of history too. Measuring up at 800mm x 1100mm this gorgeous hand carved frame with the option of a stunning bevelled, etched or unadorned mirror brings French Boutique style and a level of detail and artistry worthy of a true French artisan. The unassuming ivory finish draws the eye without being gaudy and will work with almost any colour or style of wallpaper. The carvings are solid wood and magnificently crafted and for the more modern interiors, it is also available with the frame in black. With its vintage-chic appeal, this mirror is capable of being used to create a fantastic feature on the wall of any room. They are, however, equally brilliant used as free standing or leaning mirrors. You can view the LC132 online here. Alternatively, try our FREE online quote tools and choose your own options with our award winning made-to-measure tool to create your perfect mirror, making ordering whatever mirror takes your fancy as effortless as sitting and enjoying it once it’s on your wall. It really is simple to use, tap in your desired measuring units, metric or imperial, tap in your size and voila, an instant online quote. With a choice of bevelled or plain mirror, and over 200 other frame designs to choose from, it really couldn't be simpler. Try it now, it's so easy and it's free. And as a reader of Beyond Reflection, we’re offering you an Exclusive Discount. 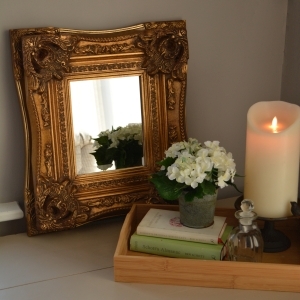 Use Code LC13220 at checkout to get an extra £20 off this gorgeous mirror now. The Ancient Egyptians, Greeks and Romans all used polished bronze and copper to make their mirrors, which were used not only as looking glasses, but items of decoration and luxury, and to exhibit one’s wealth as well; these polished metals often carrying decorative gems and engravings around the edges – much in the same vein as we use frames. 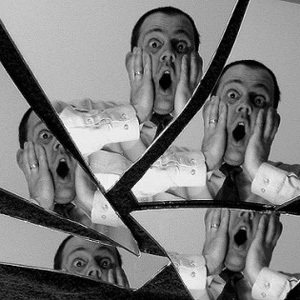 There is some dispute over the time of the creation of the first glass mirror. Some historians believe that they were created around the 3rd Century AD, others believe that they were first invented around the 1st Century AD. All seem to agree, however, that they were invented in Lebanon, most theories pointing particularly to an area known as Sidon. Both reports, though, agree that they were invented not long after the discovery of glass making. Small sheets of glass were backed with metals such as lead for the wealthy, or gold leaf for the very wealthy, to provide the reflective element to them. These early glass mirrors weren’t particularly popular, though, as they were only produced in sizes around 3 inches in diameter and the quality of the reflections were generally poor. 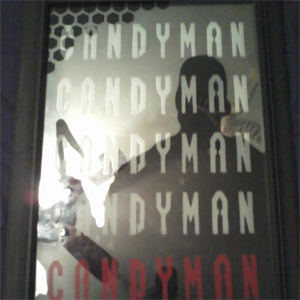 Now we have mirrors made of glass, with a fine layer of silver coating on the back. 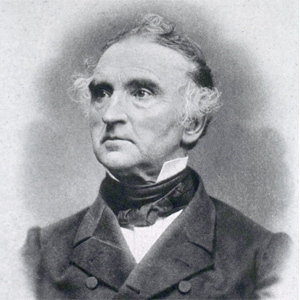 This process, called ‘silvering’, was invented by Justus Van Liebig – a German chemist - in 1835. Make sure you keep an eye on our blog and newsletters to find out more. From the 30th of January until the 31st of March, we're giving YOU the chance to WIN this beautifully carved and gilded antique style mirror. For your chance to win this fabulous prize, simply follow the link HERE and click on the buttons to visit our Twitter account, Follow us & Retweet the competition tweet to be in the running. The winner will be announced on the 31st of March. Mirror, mirror on the … moon? Mirrors show the moon is getting further away from us. The moon is, on average, 238,857 miles away from the earth, depending on its position in its elliptical orbit. 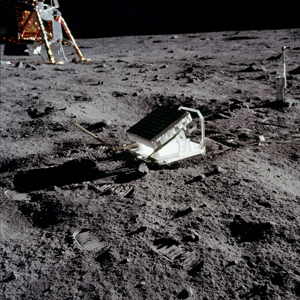 We know this because astronauts on the Apollo mission left a mirror, known as The Laser Ranging Retroreflector, behind so that it could be used to accurately measure the distance from the Earth to the moon. Essentially, it’s a series of corner-cube reflectors which reflect laser beams back in the direction from which they originate. These laser beams are aimed at the moon via large telescopes on Earth and their reflected light enables scientists to measure the distance to the moon with an error margin of merely 1inch. This is how we now know that the moon is receding at a rate of around 1.5inches per year. These measurements have even been used to test Einstein’s theory of relativity. ‘I can rough it’: Linda Barker Talks, Skip Diving, Recession Shopping and her new TV Show. She became a sweetheart of the 1990s when she shot to fame on the TV show, Changing Rooms, and it looks like Linda Barker’s about to win a place in TV fans’ hearts again with her new show. It’s been 16 years since Changing Rooms but Linda’s welcoming smile and bouncing blonde ‘do hasn’t changed a jot – which is part of the appeal of new makeover show Brand New House For £5k. "Despite being an interior designer I can rough it,” she joked, speaking about her time in the ‘I’m A Celebrity...Get Me Out Of Here!’ jungle, over ten years ago now. And the interior designer turned TV presenter certainly shows off her thrifty side in the show as she implores more people to skip-dive. She explained: "I think the recession has made everyone think in a different way. If Brand New House For £5k can get people looking in a skip before sending it to the landfill; people might be throwing out whole kitchens or ripping up floors, throwing away doors. It’s about looking into the skip a bit deeper and seeing what you can salvage." The show is described as a 'timely' new make-over show ready to help out people who have tried, and failed, to create a new living space using their own DIY skills. Linda has just one week and a strict budget to create a stunning transformation where people had previously botched the job. Speaking about the new Channel 5 show, Linda revealed it was the clients who hand over their own money – rather than the production company footing the bill. 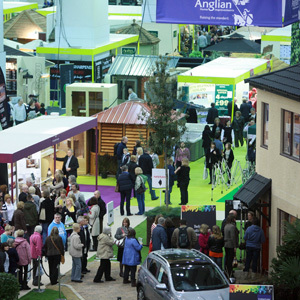 "It’s a decorating show but hopefully like no other! The £5k budget is real – it’s their money, which is very different. And we are really trying to do a massive change to the whole house. It might be that we do four or five rooms in the whole house. Essentially it’s everything for £5000, which if you’re including bathrooms and bedrooms in that, isn’t a lot." Linda’s voice really does carry a certain joy and impenetrable happiness that fans will remember from her mid-nineties heyday. 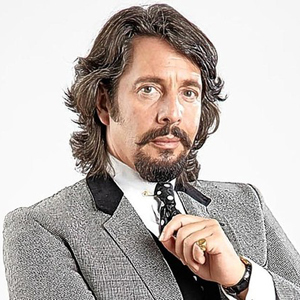 But don’t compare the two shows to one another, because, as she rightly points out, design has changed a hell of a lot since Laurence Llewelyn-Bowen was on TV in a ruffled shirt. Linda said: "It’s very, very different to Changing Rooms, although that was a £500 budget. Do you remember? We were being incredibly resourceful. Design has changed an awful lot, and the mood for design and style of design has changed enormously. It’s a very, very different programme." 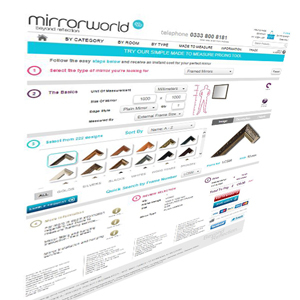 Here at MirrorWorld we’re always looking to find new and innovative ways to improve our customer experience and make choosing the perfect mirror for your home as easy and hassle free as possible. So with you in mind we’ve wracked our brains again as to what we could do to make your dealings with us even easier.Having already brought you not only the largest online selection of mirrors in the UK, but also our award winning Made to Measure tool, a huge variety of frame styles, interior design tips for which mirrors to put where, how to hang mirrors and where mirrors most positively affect the Feng Shui of your home, we’re constantly on the lookout for ways to make choosing the ideal mirror even easier. What if, we thought, you could choose to see as many frame samples as you wanted, and for the trouble of getting a sample sent out to you, receive £5 off the frame you chose from the samples you received? Well, that would be framing excellent we thought! So that’s exactly what we’ve done! Now every time you think you can’t decide which frame would best suit your room, all you need to do is ask for a sample. We’ll send you one AND even give you £5 off the frame you choose! To order your samples - simply click here and if there's anything else you think we could do to improve our service, let us know! We're always open to ideas and can be reached via email media@lecira.co.uk on Twitter @mirrorworldteam or on Facebook as MirrorWorldUK. Every now and then we like to give away free stuff. 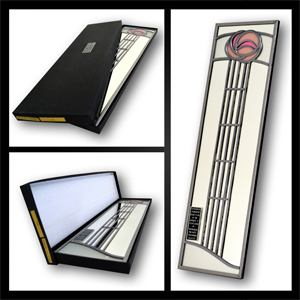 As you know, we recently ran two competitions, giving two of our lucky followers the chance to win a stunning Rennie Mackinstosh style art deco mirror. Well we’re happy to announce the winners of the competition were Ms. Melissa Manning of Kings Lynn, Norfolk, and Ms Leanne Kendrick of Cleveleys, Lancashire. Their mirrors will be winging their way to them soon. If you like the idea of getting your hands on some gorgeous stuff for free, keep an eye out for our next competition coming soon. This time, it could be you walking away with a fantastic prize. 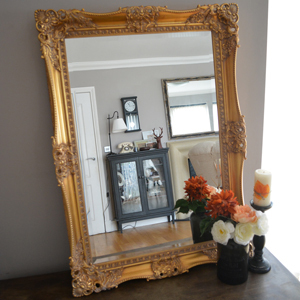 Win a Remy Mackintosh style Art Deco Mirror in this month’s FREE giveaway. Here at MirrorWorld we love to share things we think are great. So, following the success of our photo competition, we’ve decided to launch two new competitions giving on Facebook and Twitter, giving o the chance to win one of our Remy Mackintosh style Art Deco mirrors. We’ll be running a new competition on Twitter or Facebook every month, so there are plenty of chances to win. So yes, someone will win one of our fantastic Remy Mackintosh style Art Deco mirrors every single month and it could be you! The world of interior design never stands still, so to help you keep up to date, here’s a quick look at what’s on for the rest of the year. 17-20 September 2014 Earls Court, London UK's leading contemporary design trade event. Interiors, office, Kitchen and bathrooms, eco design and build and International pavilions. Super Brands London surpassed all visitor expectations, with an overwhelming response to the calibre of exhibitors, surrounding gallery events, show features and so much more! The most creative of the hubs that anchor the London Design Festival. 21 - 22 October 2014 Olympia, West Hall, London The UK's first business event for the independent, luxury and boutique hotel industry. Reflections … What do they matter? Mirrors can reflect a number of things, light, sound and also … matter! This type of mirror is known as an atomic mirrors and it reflects atoms of matter just as an orthodox mirror will reflect light. Most use electromagnetic fields, some though, just use silicon water. The reflection from one of these mirrors is effectively a quantum reflection of a wave of matter. It reflects neutral atoms that move slowly. 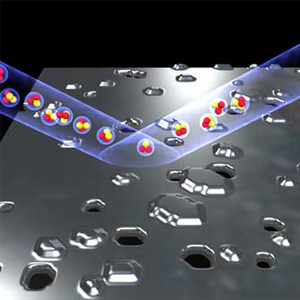 This type of process can be used to trap atoms or focus atomic beams. They also tend to work better when ridged due to the greater wavelengths of matter compared to photons of light. If you have considered such skills too expensive or unnecessary then remember - good design gives you the home you want, impresses others and, ultimately, may pay for itself handsomely by boosting the value and appeal of your property when you come to sell. msmonro Chelsea-based, this is Britain’s longest-established interior design consultancy, will design gardens as well as homes. ashtonhousedesign Seven-person design consultancy with large showroom in Ashburton, Devon. fisherid Kent-based with 30 years of experience in high-end residential interior design. Has handled very high-end London and south east residential design. simshilditch Has a mission “to make everyday living comfortable, engaging and inspirational”. Based near Bath. 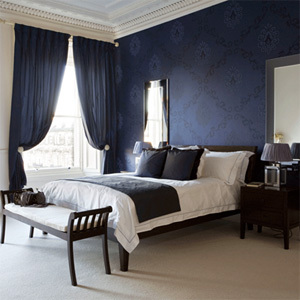 siobhanmooney Edinburgh design team handling room layouts, electrical plans, soft furnishing, fabrics, sourcing of antiques. carolynparker Mother-and-daughter team, Yorkshire based but operating across UK and in Portugal. kellyhoppen Kelly is a celebrity interior designer (she is a Dragon’s Den dragon) with her own range of fabrics, paints and furniture. pascoe interiors This Chichester firm specialises in blending vintage furniture into contemporary surroundings. infinitedesigndevon Interior designers operating mostly in the South Hams. suedanninteriors Buckinghamshire-based firm offering full design service but specialising in bespoke kitchens. marybarberfray The website offers design tips and the firm offers services from designing one window to refurbishing a whole house. Birmingham-based. cloudstudios This Oxford firm has worked on country house interiors as well as modern urban homes. wilkinsonbevandesign A Birmingham-based firm that has worked on ski chalets, Caribbean villas and British homes. juliettebyrne High-end London interior firm which also offers property management services. woodsinteriordesign Based in Harrogate the firm specialises in country houses across the UK. liza evans A central London firm which also offers to source antiques for clients. mc call design. This London team has worked on high-end clubs, sporting premises, offices and homes. 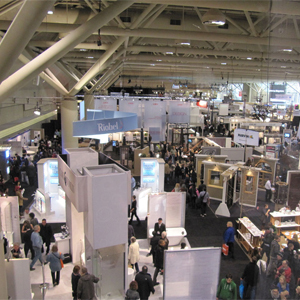 Decide exactly what rooms and ideas you have before commissioning a designer. 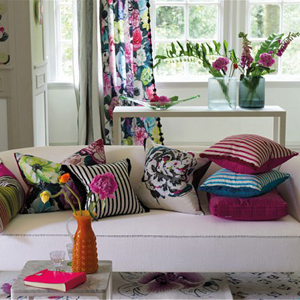 Collect fabric samples, photographs and colour charts to focus your ideas. Ask friends and colleagues for experiences and recommendations of designers. 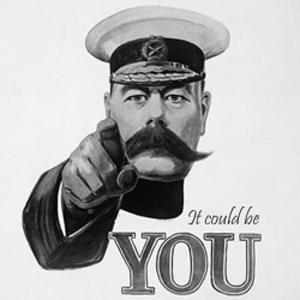 The British Institute of Interior Design posts a list of members on www.biid.org.uk. Most designer offer a free first consultation, so try several to assess attitude and competency. Check rates (many charge circa £75 an hour, others up to 15 per cent of project cost). Ask whether VAT, labour, materials and project management are included in fee. Encourage your designer to source and buy materials (they will get trade rates). If you directly pay interior design labourers, budget for £500 to £1,000 per room. Secure a firm schedule from your designer, especially if (s)he is project managing. 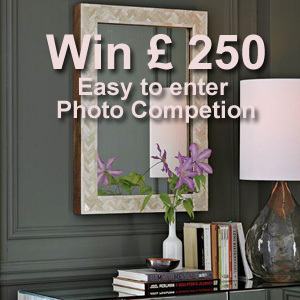 As you’ll all know, we recently ran a photo competition giving the chance for one photographer to get lucky and win a fantastic prize of a £250 voucher to spend on anything from our range of mirrors. We were overwhelmed by the standard of all the entries and spent a long time deliberating over which of the photos we felt was the most deserving of the prize. So MirrorWorld would like to say a huge, ‘congratulations’, to Mrs Z Price who has won the voucher, with her homely living-room photo. We will announce our next competition shortly, so don’t forget to keep an eye on our website, Facebook page and twitter feed to find out how you too could win some fantastic prizes courtesy of MirrorWorld. English furniture designer, Thomas Sheraton 1751 - 1806. Featured designs for cheval mirrors with drawers on one side and with writing surfaces attached in his 1803 edition of ‘The Cabinet Dictionary’. Possibly becoming the earliest designer of what now know as the modern Cheval Mirror. 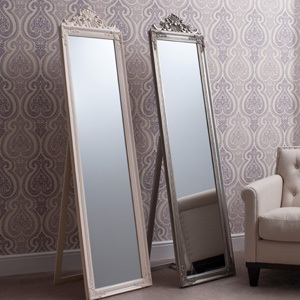 With autumn drawing in, what better way to warm up your room than with a beautiful, warm, luxurious new mirror? With an elegant, antique style, the LC132 from our Antique and Ornate selection you can add an instant touch of sophistication to your lounge or dining room. With its delicate carvings and gilded finish not only does it add style, it adds warmth too. 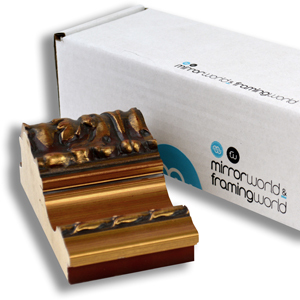 At 95mm wide this elaborate, hand carved, worn gold finished frame with the option of a stunning beveled mirror, brings both extravagant proportions and a level of craftsmanship worthy of artisans. It is indeed a king amongst mirrors. Despite its extravagance it is still magnificently understated in the classic French style and suitable for almost any room. The frames are solid wood and beautifully crafted with a stunning gold leaf finish. For the more modern interiors, it is also available in both black and white versions. With such elegance and size, this mirror is capable of being used to create a fantastic feature on the wall of any room. View the LC132 online here to see the beauty and excellence of this frame for yourself. Alternatively, try our FREE online quote tools and choose your own design to create your perfect mirror, making ordering whatever mirror takes your fancy as effortless as sitting and enjoying it once it’s on your wall. It really is simple to use, tap in your desired measuring units, metric or imperial, tap in your size and voila, an instant online quote. 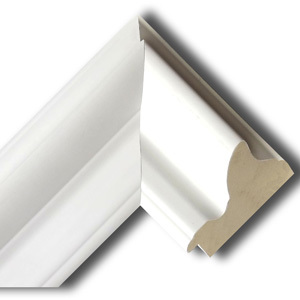 With a choice of beveled or plain mirror, and over 200 other frame designs to choose from, it really couldn't be simpler. Try it now, it's so easy and it's free. And as a reader of Beyond Reflection, we’re offering you an Exclusive Discount. Use Code LC13210 at checkout to get an extra £ 10 off the LC132. Ever since Narcissus was first bewitched by his own image in Ancient Greek mythology, mankind has been fascinated by the ethereal facets of mirrors and the worlds they reflect. As a result of this fascination an inordinate number of myths and legends have been attached to mirrors by countless different cultures throughout history. Here at MirrorWorld we’ve had our interest piqued, so over the next few editions, we thought we'd explore some of the more weird and whacky myths out there. Mirrors have long been associated with magic rites and rituals. This stems back from as long ago as the Ancient Greek times. One of the foremost uses of mirrors in magic has been for divination; the art of fortune telling and predicting the future. In Ancient Greek times, this was known as either catoptromancy or enoptromancy, and involved the witch or magician who practiced the art dangling a mirror on a thread, until its lower edge touched the surface of the water. Then, by looking into the mass of reflections created by the mirror and water reflecting each other, the future could be told. Another of the many magical practices that mirrors have been used for across the years and cultures is that of scrying. Scrying is one of the oldest types of divination in recorded history, first appearing in China in 3000 BC, then later in Egypt in around 2500BC and Greece circa 2000BC. The word, 'scrying', comes from the English word 'descry' which means 'to make out dimly' or 'to reveal'. There have been multitudes of uses for scrying mirrors throughout history, most commonly; to see the future or past, to find lost objects or people and to track criminals, or others if your purpose was less savoury. In Ancient Rome, diviners known as 'blindfolded boys', were known to gaze into mirrors to experience hallucinations of the future. According to the 4th Century text, 'Scriptores Historiae Augustae', the death of Julian the Apostate was correctly prophesised by blindfolded boys using this technique. The famous 16th Century French apothecary and supposed seer, Nostradamus, is said to have used a mirror made from black obsidian for his divinations. More recently, 1853 Brothers Grimm fairy-tale, Snow White, makes use of a magic mirror, showing that these superstitions, if not entirely believed, have certainly survived the test of time. 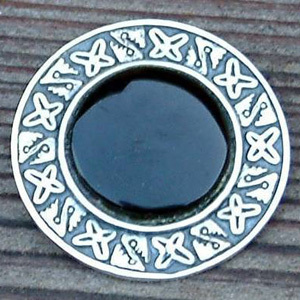 Some believe an alternate use for scrying mirrors made from obsidian is to view yourself in parallel or past lives. By standing in a dark room with a candle (torch these days) below your face, after staring into the mirror for a while, you will see your features repeatedly change. 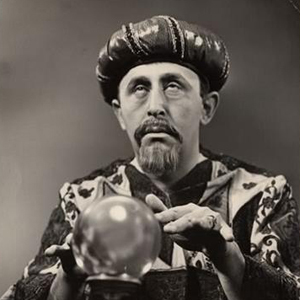 At MirrorWorld, we can't predict the future, but we can make you the fairest mirror of them all! Measuring Up To Your Expectations. Buying things on-line can be a nightmare. You know what you want, but the website you’re using is difficult to navigate. Doesn’t seem to have an option for the colour you want. Doesn’t have an option to adjust the size. Its ‘bespoke’ service just isn’t bespoke enough. Well here at MirrorWorld we’ve had the same issue, so we sent our IT boffins away to come up with an online solution so user friendly that even the least IT savvy of our team could have no problem using it. And we’re proud of what they came up with; our Made to Measure tool. So proud in fact, that we want to shout about it. And we think you should too. With easy steps allowing you to choose your perfect product from the UK’s largest range of bespoke framed mirrors and over 200 frame designs to choose from, our framed mirrors are available in sizes of up to 2.8 metres x 1.8 metres and come delivered straight to your door. You can even request samples of the frames that catch your eye to make sure the one you choose is absolutely, unquestionably the one you want. And, because we’re always looking for ways to continually improve our service, we’re currently in the process of redesigning our sample distribution process to allow you to take as many as you want, too! (We’ll tell you more about this when it’s ready to go). 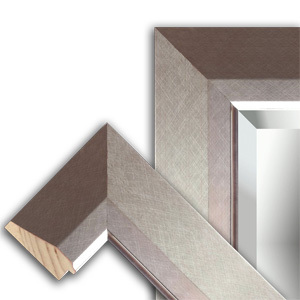 We're sure you can see why we’re so proud of our award winning Made to Measure framing tool. Make sure you try it out next time you need a new mirror. 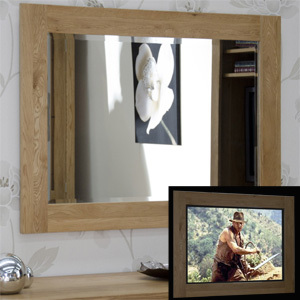 We’re absolutely convinced there is no better way to get a bespoke framed mirror for any setting. 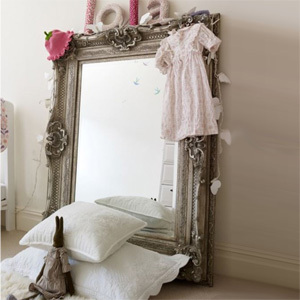 We even offer free delivery on ALL of our made to measure mirrors. 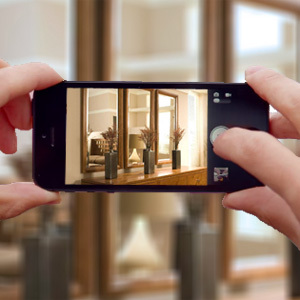 There is no easier way to guarantee that your home or office gets exactly the mirror you want! 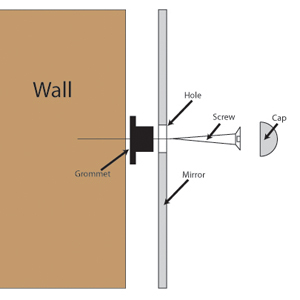 Known as acoustic mirrors, these devices are used to reflect and focus sound waves. After the First World War and prior to the Second World War, a series of these structures (also known as Sound Mirrors or Listening Ears) designed as an early warning system for Britain to detect enemy aircraft, were built at Dungeness in Kent. 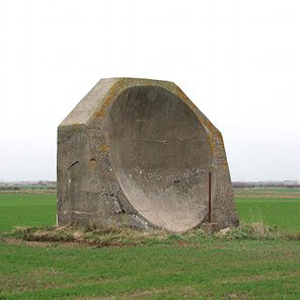 Built between 1928 and 1930, these three concrete, ‘listening ears’, actually formed a fragment of Britain’s national defence strategy and ranged between 20 and 200 feet in size. They were designed to detect the sound waves emitted by the approach of enemy aircraft as they flew over the Channel. They work by catching the sound-waves in the centre of the mirrors and transmitting them via a series of microphones and stethoscopes to an operator who would raise the alarm, ensuring that anti-aircraft guns were positioned in time to counteract any threat. The mirrors generally gave between 10 and 15 minutes warning before any looming attack. 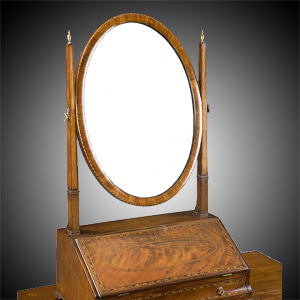 The first of the mirrors to be built was the smallest, 20 feet in diameter. It was precast as a single slab of curved concrete. By the time the second mirror was built in 1930, lessons had been learnt. 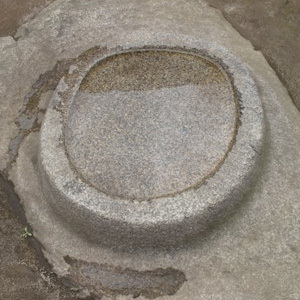 The second mirror was 30 feet in diameter and was set alongside the original mirror but at a slightly different angle to provide superior accuracy. The third and final mirror was 200 feet long and 26 feet high. It was also built in 1930, along the same stretch of coast as the original two and had microphones attached to its curved surfaces. In positive conditions, it could detect enemy aircraft up to 24 miles away. The mirrors functioned most effectively for slow moving aircraft. They worked by concentrating sound waves towards the centre of the, ‘mirror’, where the microphone was located. However, their effectiveness diminished as aircraft became faster. Their operators also found it problematic to differentiate between aircraft and seagoing vessels. The mirrors can be found to this day on an island at Greatstone Lakes in the Dungeness Nature Reserve. They are private, though, and can only be accessed on open days and during special guided walks. The only sound mirror outside of England is situated on the island of Malta, in the Mediterranean. It is known to locals as, ‘il widna’, which is Maltese for, ‘the ear’. Despite the initial success of the acoustic mirrors, they rapidly became obsolete due to the invention of radar. Here at Mirrorworld we often get asked for some unusual requests, especially when it come to the shape of mirrors and we like to think that over the years we have just about handled all of them. But one thing always eluded us until now. Customer designed shapes. Clouds, waves and smooth rolling curves, has never an easy thing to cut from mirror, until now. 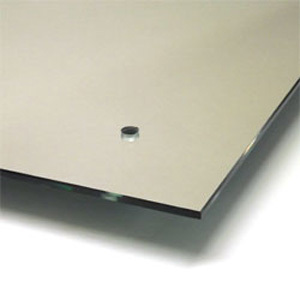 One of the most common request involving shapes and mirrors is; “can you cut a square hole in a mirror?” Whilst it’s always been true that cutting perfectly square holes in glass is very much impossible given the physical properties of the material and how the molecules all line up different directions, with the introduction our new water jet cutting technology it masking the seeming impossible, possible. Now cutting holes for those pesky light switches and sockets is a breeze, no more irritating joins in the wrong places, just nice clean smooth mirrors. But it’s not just for cutting holes either. Being able to shape mirrors opens up a whole new realm of opportunities to get creative. So simple shapes like circles, oval and arches are just child play when the world of curves is your oyster. 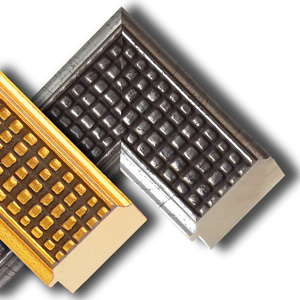 So no need to be square, or rectangular for that matter… Dare to be different. If you have a creative shape idea for your mirror, why not send a simple sketch and let’s see if we can make the impossible mirror possible for you today. When Donna and Marc had extended their Essex home several times, they really loved their new space, but when it comes to decorating, they reached a bit of an impasse. Being passionate about their home they reached out for help in the shape of the popular TV show “Love The Place You're In” and appealed for help. So, when Interior designer Gordon Whistance stepped in for some well need help and guidance, bestowing his wealth of knowledge and experience to aid with the difficult decisions on a creative style, so that they could start loving their home again. One part of this makeover involved Gordon’s need for a centre piece contemporary mirror, one that would be tall and bold perfect for their home but would not be too overpowering. We knew that our LC86 A full length black framed mirror would be perfect for his needs, with its simple and elegant satin black frame set of by the bevelled mirror, reflecting light angled light and created subtle illusions of depth, often vibrant and unmistakably eye-catching. With the final concept complete, it was commonly agreed that the centre piece mirror was the finishing touch to this style makeover. 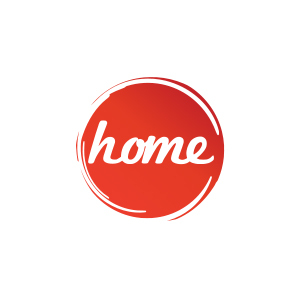 Check out the Home website it has some really informative and useful time for interior design and practical advice. In our never ending search for interesting articles for our reader we often come across something with things worth passing on and we feel "Moodboards" from HouseToHome is worth a look. Using Moodboards allows you to save and store images from your favourite articles, images and ideas from the HouseToHome web site. 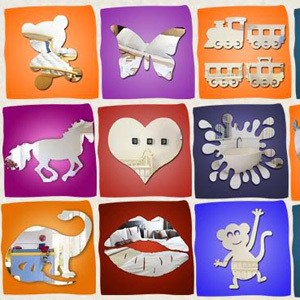 You can save as many as you like and start to get creative with your favourite ones. Rotate, resize and mix together the images you've selected in your own private workspace, creating a unique and professionally styled room design. With the ability to print, email and share, be proud to show off your finished Moodboards to friends and family or even share then via Facebook and Twitter. Take a peek at their easy to follow video tutorial too.. Here's your chance to Win £ 250 in our Free To Enter Photo Competition. At Mirrorworld we're always pleased when customers get in touch to say how delighted they are with their new mirrors and how well they've complimented their home design ideas. Well, now is the chance to show that off and win £ 250 into the bargain. The chance to win this fabulous prize really couldn't be simpler, just take a photo of any mirror using your skill and artistic prowess and send in via email to photocomp@mirrorworld.co.uk together with your contact details of course and you could be in with a chance of winning that £ 250 first prize. We also have 10 smaller prizes for the runners up to. Times running out...It's your last chance to get your entries in for our FREE to enter photo competition. Entries must be in by Monday 30th June, so hurry, take a quick snap of your favourite mirror and send it in, you never know..
We're looking for inspiring and artistic photographs of mirrors taken in the home for upcoming editions of "Beyond Reflection"
If you've got a budding David Bailey in the family, get them to take a photo of any mirror in the home in an artistic fashion, then simply email it with your full contact details to photoComp@mirrorworld.co.uk for a chance to win £250 First prize, or 1 of 10 runners up prizes of £ 25 to spend at Mirrorworld. It's easy to enter why not have a go..
A full list of rules and terms can be found here... Good luck. 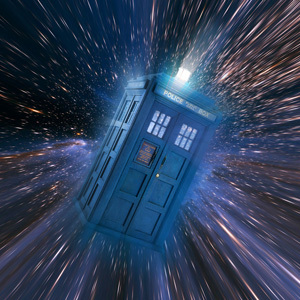 We all heard is possible to travel through a wormhole and back time, right? However, there's just one snag, they tend to collapse, which stops anything from passing through them, sort of defeating the object really.. But, help is at hand, with a simple pair of mirrors. All you need is two uncharged mirrors (or metallic plates) in a vacuum, placed a few micrometers apart—make sure there is no external electromagnetic field. Now comes the Casimir effect, which is a physical force arising from a quantized field between the two mirrors. There are many uses for mirrors around the home and workplace in everyday life and not just the obvious. Mirrors can be so much more than your beautiful self portrait. Following here are just some of the basic concepts that start to show that there is more to the humble mirror than first meets the eye. When physical space is at a premium, mirrors can be used to create the illusion of extra space. Using mirrors to create a sense of more space is a professional trick of all the best interior designers. By fooling the eye (trompe l'oeil) into feeling there is a greater amount of space than in reality. For couple of clear examples, visualise a small bathroom with just enough room for your suite, then imaging a large wall size mirror behind the bath or sink. 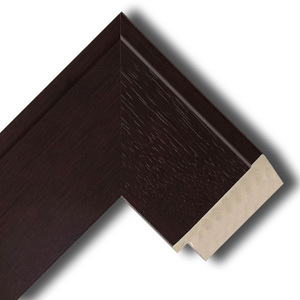 This has the immediate effect of doubling the room size, without the need of a costly extension. Or, if you have a short entrance hallway, by simply adding a large mirror to the far end of your hall, the depth of the hallway perceivably doubles the length, to make a memorable grand entrance. This is probably by far the easiest way to get the best out of your mirror. Nobody these days likes living and working in a dark room or office. With the clever placement of mirrors, the extra light can bring rooms alive. Try placing the mirror where the sunlight falls in the room, allowing the available light to bounce around, lighting up those darker corners with the added natural light. Or try putting you mirror behind an existing light can double its affect, bringing extra light to otherwise dim surroundings. With a little thought, it's easy to make the best use of the light that's already available. For those amongst use with inner karma, consider the use of mirrors within Feng Shui is very important. 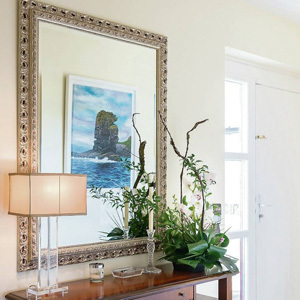 Sometimes referred to as the aspirin of feng shui; with proper placement, mirrors can dramatically shift the flow of Chi, or feng shui energy in any given space, bringing with them a sense of refreshment and calm. 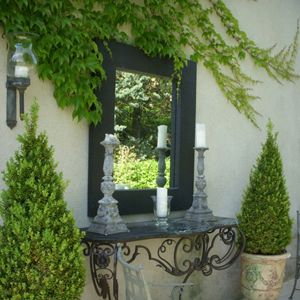 With most mirrors being defined by shape, (oval, round, square) and frame materials (wood, metal, etc.) a typical example of the feng Shui influence would be a round mirror with a gold leaf frame which would be seen as beautiful feng shui wealth and abundance, cure and work very well in the feng shui money area of your home or office. 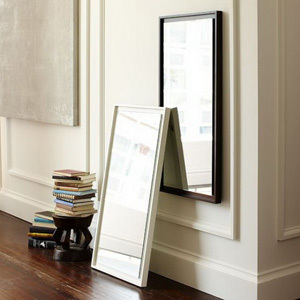 Without doubt, the most common mistake we all make about mirrors is using them as a replacement for artwork on the wall. An easy mistake to make but just as easy to remedy. When choosing a mirror for the wall, ask yourself a simple question, the answers will quickly unveil the right choice of mirror for your chosen location. What do I see in the mirror from its most common view point? For example, if the mirror is above your mantle piece and you commonly view the mirror from the comfort of your armchair or couch, the view in the mirror may just be a boring ceiling. The solution to consider here would be a choice of interesting or more decorative frame, with the addition of a reflective focal point like a small vase of flowers or attractive ornament on the mantle. 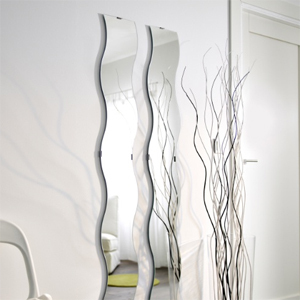 These being reflected in the mirror, enable you to see your objet d'art at its best from all angles. The golden rule to remember is, what you see in the reflection is your artwork. Wow, the title says it all. 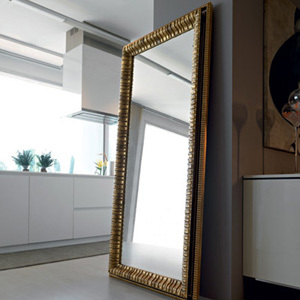 For making the most of a mirrors dramatic effect, size IS everything. Whether it's the frame size, a good chunky solid frame or the mirror size it'self, if it's drama you're after don't skimp! 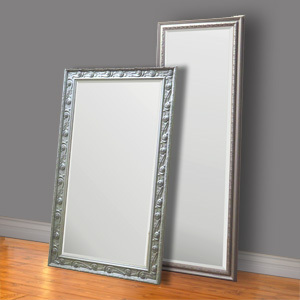 A relatively low cost entry level to this genre of mirror would be the full-size floor mirror. These can make a dramatic statement in a small space. Using a framed, full-size mirror placed on the floor and resting on the wall can become an incredible asset in many ways in a bedroom, living room and even at the end of a hallway. What more, if you get fed up with it in one room you can always move it on to the next, no strings attached, so to speak. Have fun, and embrace the world of mirrors..
At Mirrorworld we're always striving to improve our products and services, being innovative and leaders in search of perfect. Sadly, we all know that's not always achievable. However in our pursuit we've just added another fantastic feature to our website that's yet another step in the right direction and worth shouting about. Most of our clients are already be familiar with our awarding winning online mirror tools, their new and improved layout and usability, introduced last Autumn. Now, by popular request is the ability to save your quotes direct to your inbox, saving your little grey cells. The saved quotes nestle safely in your inbox allowing for easier comparisons and effortlessly retrievable for later use. Without the need for scraps of paper your emailed quotes will contain all the information you'd require to compare like for like quotes, with details similar to edging type and frame design, allowing the simplest of comparisons of multiple choice options on any number of designs. With every quote come two simple buttons. The first takes you straight to purchase our button of choice, with the details already stored and another to return to our online tool for further tweaks or amendment to your requirements. And it's all absolutely FREE. Please have a go and tell your friends. Ordering a made to measure mirrornow made easier for your convenience. 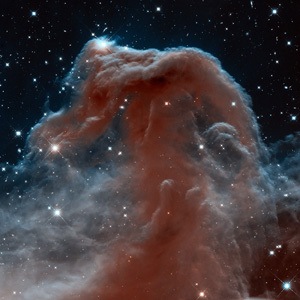 You may already know the Hubble telescope and its stunning pictures taken from space, rightly classed as one of NASA greater achievements. But did you know it nearly never took any pictures at all? When the pictures were first sent back by the telescope they we blurred and fuzzy, all down to the optical main mirror being too flat. Saying that, it wasn't by much, a mere 2.2 microns, or to you and me about 1/50th the thickness of a human hair - but even by this smallest of margins it nearly put the whole project in the annals of historic epic fails. A small speck of paint it thought to of been the culprit, stuck to the measuring device used to test the mirror, resulting in a false reading of the measurements. NASA scientists however, don't give up that easily, and their clever boffins came up with a workable solution in 1993. By using an instrument they called the Corrective Optics Space Telescope Axial Replacement (Costar). just trips f the tongue doesn't it? They managed to counter the problem with the main mirror, by complementing it with an opposing reading. Our client is a large blue chip corporation who regularly invites members of the public to their premises with the sole purpose of testing their various products. They wanted the ability to observe the test subjects without them being aware. They currently used a privacy film fixed over a 5 x 1 metre window and it wasn't giving them the desired results they required as members of public could see their observers and it offered no em any safety protection against damage. We felt our laminated two way mirror was ideal for this customer and supplied them with several samples of two way mirror so they could carry out their own tests for suitability. 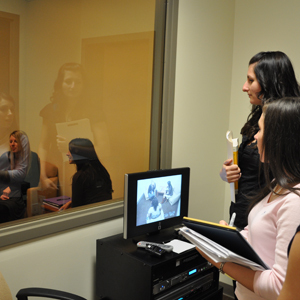 The laminated two way mirror was their preferred option because it offers a bronze observation side which gave them the additional privacy they needed and because it was laminated if the glass broke it would remain affixed to the laminate as opposed to shattering into large pieces of glass. The client wanted the two way mirror to fit into their existing window pane and we organised an initial survey so we could ensure the new mirrors fitted. The client was so delighted with the service we supplied they requested not only did we supply the two way mirror but installed it too. Once we'd stopped messing around in puddles for our mirrors ( see earlier article ) the more forward thinking civilizations started to think of other ways to see themselves. Carrying around a pool of water around in your pocket didn't seem too convenient not to mention wet.. 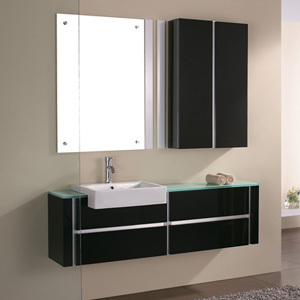 If it's a simple quality bathroom mirror you looking for, then look no further. When it comes to choosing a simple mirror for the bathroom there are many more options than you may think available, polished edge or bevelled edge, with holes or without? Do I want to hang the new mirror, or use clips or even simply stick it to the wall? Even with these options decided you might even be consider adding a heated mirror pad, to eliminate those horrible misted up mirrors, that are neither use nor ornament once you've stepped out of your nice hot bath or shower. Plus, what shape would I like, what gauge or thickness should it be? the list choices can go on a bit. 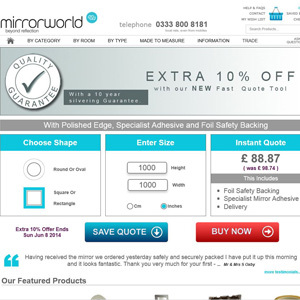 For those discerning customers who know what they want, here at Mirrorworld we do believe in giving you all these options and more, and with our simple to use online quote tool, it's easy to mix and match lots of these options and obtain a fast free quote too, ready to just pop into your basket and have delivered direct to your door, hassle free. But for us mere mortals, that just want a new mirror for our bathrooms, some of these options can seem daunting and even confusing. So now our clever web designers have come up with a great compromise, with our new "Fast Quotes" pages. Fast Quotes, are a simple to use way to order the mirror you're looking for easily and effortlessly. With just a couple of straight forward questions. What shape would you like? and what size would you like it? If you happy with the instant price, pop it in the basket and you're done, we do the rest. Here's what's behind the scenes. We use only top quality Pilkington Optimirror™ glass, the leading mirror glass in quality and clarity, if fact we're so confident of the quality we give you a 10 year silvering total satisfaction guarantee. 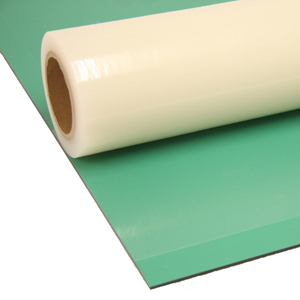 For safety and your peace of mind, each mirror is safety backed using heavy duty polypropylene safety film to BS 6206, meaning, should an accident occur the mirror won't end up all over the floor in dangerous shards of broken glass, but all held together safely for easy disposal. Each mirror comes, pre-drilled ready for installation using chrome caps screws, which, of course also come with the mirror, along with the special rubber seating grommets. Finally, the mirrors are securely packed and delivered to your door. And, if that not enough, there's even an extra 10% off the normal price. Having worked on five Princess Margaret Home Lottery abodes, Trish Johnston knows how to handle over-sized interiors. 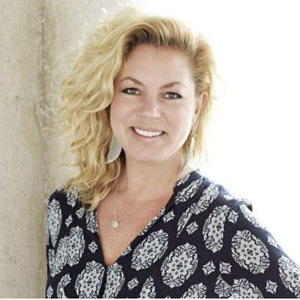 But these days Johnston, currently the on-air design expert for CBC’s Steven and Chris show, is having her way with small, cost-effective spaces. There was, for example, the stunning transformation of an eight-by-24 foot galley kitchen into a handsome, highly functional space featuring lots of accessible, affordable options from Ikea. Not that Johnston had to be sold on the charms of small spaces — her own home is a 1,300-square-foot penthouse in the Annex that she shares with husband Greg and sons Jack, 12, and Finley, 10. Looking out from her fifth- and sixth-floor condominium home, Johnston says she feels like she’s in a European city. With two bedrooms and two bathrooms, the space would be a squeeze for many families. But Johnston says it’s an ideal size for an urban family. The trade-off is giving up a yard. Not such a big deal, says Johnston. Ten-foot ceilings found favour with Johnston, as did an abundance of natural light. “That always enhances quality of life,” she says. Hence, the boys’ 10-by-10 foot bedroom also serves as a playroom. Others may have limited such a confident blue to a single wall, but not Johnston. Johnston eschews the notion that dark colours shrink a room. “In fact, darker colours make the walls recede,” she explains. There’s another dominant splash of colour in the small office from which Johnston runs her design business — a cheery red carpet. Still, the master bedroom is washed in calm whites and serene neutrals, only lightly leavened with hits of sunny orange. Johnston is perfectly content with its economical eight-by-10 foot surface. “For me, the bedroom is just for sleeping and, uhm, cuddling. I don’t need it to have other functions,” she says. Mirrors are one of Johnston’s tricks for making light bounce to create a sense of space. For example, two mirrors — one with a decorative frame, the other a plain rectangular slab — sit at right angles on a chest tucked into a corner. The same treatment is used in a lounging space, one of those spots Johnston describes as a “getaway” area. Another wall is papered in a large, classically inspired print featuring watery blues and shimmery metallic tones. The immediate effect is a big bolt of colour. Viewed at any distance, however, it becomes apparent that the paper, like the drapes in the boys’ room, has large bands of white to temper the hue. Johnson says “the design pickle” that husband Greg solved revolved around an awkward door on the wall that was to be papered. He suggested papering it, too. To finish, casing was colour matched and a pretty knob from Anthropologie added. The seamless look pleased Johnston, who’s drawn to symmetry. Quirky touches include pieces like the coffee table that Johnston and her husband found on the way home from a party. Many moons ago it was openly believed that your reflection was an image of the soul. So breaking a mirror whilst looking into it, condemned your soul to broken too. That's one of the popular explanations behind that seven-years-bad-luck superstition. Another perhaps more believable thought was that in the eighteenth-century mirrors were way too expensive to break. And until quite recently in fact, there were parts of Ireland where a mirror is covered when there's been a bereavement in the house – thus preventing the soul from getting trapped in the mirror. Creepy! It's always wise to take care when deciding where to hang you mirror, it not as simple as placing a bit of card on the wall to judge where it might fit. 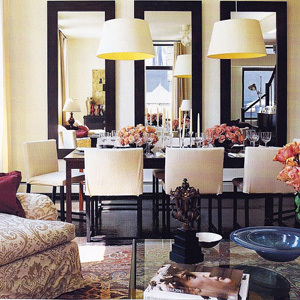 Mirrors are a very powerful interior design tool, which can make or break all your other careful planning. One way to maximising the reflective qualities of your framed mirror is to choose a "reversed moulding" frame design, where the central piece of glass is slightly raised by the frame, giving the mirror surface a different perspective away from the wall. The hallway is such a popular place for mirrors, bringing light and that sense of depth in what can often be a dark and narrow space. This makes for good juju. 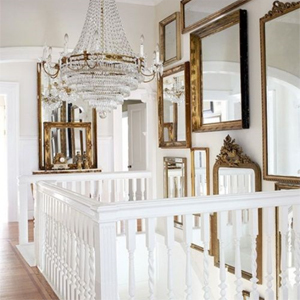 Mirrors are often called "the aspirin of feng shui" and to place one at the bottom of your stairs is meant to invite health, wealth and happiness into your life... Bring it on! There are of course some more immediate and obvious benefits. It's make perfect sense to have a mirror by the door, so you can do a quick check that what was left of your lunch remained on the plate and not on your chin. However from a designers view, have less competing furniture in a hallway always much great scope for choice and experimentation. A strategically placed full length mirror in a hall wall can have amazing effects and illusion of space, giving an immediate and visible impact, adding a tangible sense of depth and greater grandeur to even the smallest of entranceways. Two way mirrors... not just for spying..
Part of the ever fascinating aspects of working with mirrors is that we're constantly coming across new and innovative ways to utilise our mirrors and mirrored materials in everyday life. One of the more recent trends being the use of "two way mirrors" is to conceal or hide TV's and computer screens. Whilst the modern TV is not as big and cumbersome as its older predecessors, the new slim line designs give users a great opportunity to fulfil every interior designers secret ambition. How to have a big TV in the room without upsetting the balance of what they've worked so hard to achieve. Now here at Mirrorworld, we're able to offer a number of innovative solutions, whether you'd like a TV behind the mirror on the wall in your bathroom or simply just like the lounge TV to blend into the background when not being used. With the use of our new "Ultra Mirror Glass" we can achieve all these scenarios whilst retaining, unlike other glass solutions, almost all the light coming from the TV it's self. The glass is prepared with a very special coating formulated to allow the majority of light through, just like a normal window, but then when the light from one side is suddenly removed the special coatings, particles come into play, acting together like tiny mirrors, combining to give an overall believable mirror effect. With thoughtful use of masking, what was once a simple bathroom mirror can now become a futuristic, multi functioning enhancement to any bathroom. Or indeed, with the combined use of Ultra Mirror Glass and a choice of frame from our extensive range, you can now truly transform what was a boring TV into a piece of interior design, proud to adorn any lounge or living space. Use our web site to find out more about this exciting new development, or our online facilities with free instant pricing tools and design selections. Call 0333 800 8181 and one of our experienced sales team will help you choose the right solution for you. We all take them for granted now, but what did we do before glass? before mirrors? Well, the early civilization didn't take long to come up a very rudimentary but rather neat solution. Simply carve a hollow in the stone and let it fill with water, voila, instant mirror, easy really. 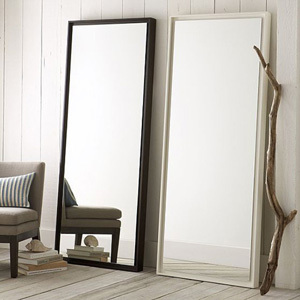 Wall mirrors make just excellent home accessories for any budding interior designer. Big or small mirrors capture the beautiful nature of light, enhancing rooms and making them look more spacious and bright, while visually elongating even the smallest of spaces. Wall mirrors and our beautiful mirror frames offer fantastic interior decorating accents that set the moods and define interior design style. Decorative wall mirrors and quality mirror frames can be utilised in differing ways to spice up modern interior design ideas and thus creating unique and dramatic room decor. 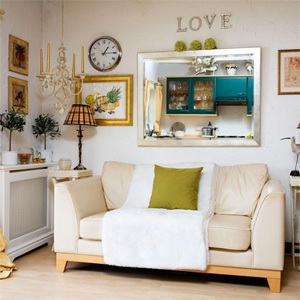 A large framed mirrors become the focal points of interior design and decoration. 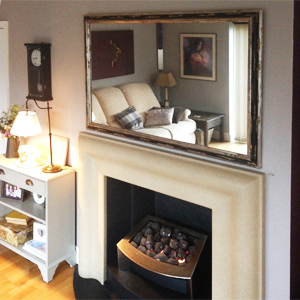 The use a large mirror in living room is perfect, to define the central point and decorate your fireplace or mantle. Even in a small room or apartments, attractive large mirrors can look wonderful on empty walls, increasing a room visually and creating stunning centrepieces for modern interior design and decorating. Salar de Uyuni in Bolivia has the current accolade of being the the world’s largest salt flat, measuring 10,582 square kilometers (4,086 sq mi). Approximately 30,000–42,000 years ago, the area was part of a giant prehistoric lake, Lake Minchin. When it dried, it left behind two modern lakes and two major salt deserts, Salar de Coipasa and the larger Salar de Uyuni. Covered by a few meters of salt crust, with an extraordinary flatness. The average altitude variations within one meter over the entire area of the Salar. The large area, clear skies and exceptional surface flatness make the Salar an ideal object for calibrating the altimeters of Earth observation satellites. 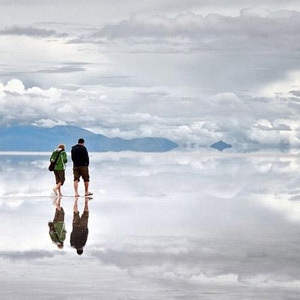 When covered with water, this extraordinary place becomes one of the largest mirrors on Earth. Making the best of what you’ve got. This sums up the situation for most homeowners – y’know, those of us who don’t own rambling mansions, country castles or uber-cool new-builds. Here on 25BH we feature homes of all shapes and sizes (so keep sending ‘em in folks!) and this includes small, sorry, bijou properties. There are many ideas for making compact spaces look bigger and none more so than the use of mirrors, white walls and pale furnishings. This one has all of those, so well done that homeowner. Now it’s easy to miss, but don’t you love the reflection in the mirror, which reveals the multifunctional nature of this room. Good interior design strikes a balance between ornate and plain, colour, contrast, light, space and flow. The reflective quality of glass and mirrors throughout your home both enhances the quality of light and adds to a feeling of spaciousness. 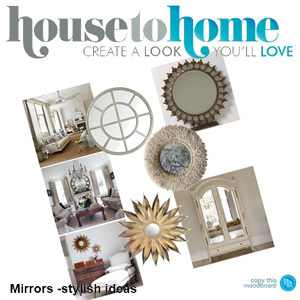 Your choice of mirror style, size, finish and placement can showcase your individual design taste as much as any other part of your home décor. Bespoke mirrors let you put in place tailored pieces that perfectly fit your home, and can be easy on the budget as well. and all the fastening options needed to hang the mirror. You can even price in the cost of installation. All the way through the quote you are guided by a gallery of images, and if you know what you want, the whole process will take you less than five minutes. Once you hit the quote button, you can be assured that you are getting a fully inclusive price including delivery. Mix and match any features, add or remove any items, and browse for as long as you like before making a decision. There are few limitations on made to measure plain mirrors. 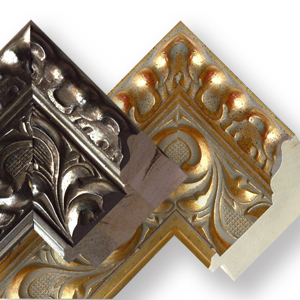 Combinations of custom shape, size, finished edge and framing let you recreate period styles like Art Deco or Victorian. Beautiful Functional Bathrooms - Clean contemporary lines of glass and plain mirrors particularly lend themselves to bathrooms, an area where function tends to precede form. However, there's no need to sacrifice style when you're fitting your bathroom out with mirrors cut to size. 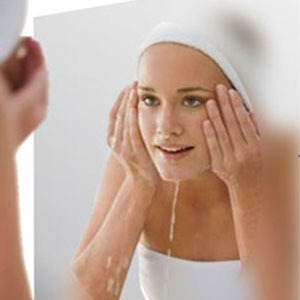 Take the heat out of sharing a bathroom with dual mirrors that give plenty of face space to each person. On reflection, may be not! A lovely gift for his beautiful wife turned it a bit of a white elephant. 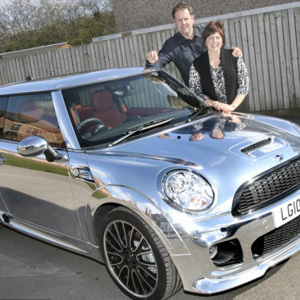 When Ian Grice paid £30,000 for a chrome-plated Mini Cooper as a Valentine's present for his wife Toni, he thought he'd made a fantastic choice of gift. Now Ian's been left to reflect on his decision. I’m really not looking forward to winter. I just want to hibernate until spring – and I think I’ve found the perfect bedroom in which to do this. and throw, while the dark wood furniture completes the elegant look. The matching tall mirrors, behind the bedside tables are an eye-catching detail and make a refreshing change to framed prints. I love the dark, snug, cocoon-like feel they’ve created. 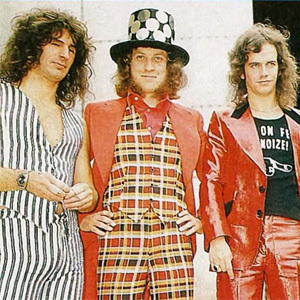 Noddy, has given away to charity all his hats and most of his outfits from his days as lead singer with Slade…..except the mirrored top hat which is securely stored in a London bank vault!